The bell curve of scores began to take shape after today's round three of the 2012 U.S. Championship and U.S. Women's Championship. With six of the 11 games pitting first-time opponents against each other, a lot of unknowns preluded the afternoon. The top two rated players pulled ahead in both competitions, with one surprising party crasher in the women's tournament. The ascent of GM Hikaru Nakamura and GM Gata Kamsky, who are joint leaders with 2.5/3, took divergent yet typical paths. Nakamura used investigative research of a topical variation that led to a swashbuckling game. Kamsky avoided a rigorous theoretical test and slowly took over the board with his bishops. A chess fan could probably guess which player was which without even seeing the names attached to the games. Robson had not focused as much on 1.e4 during his preparation. “I wasn't sure what to do against 1. e4 because all of the lines I thought about, somehow there are some small holes I thought [Nakamura] could play into,” he said. His prescience proved accurate. Robson was forced to invest a small amount of material to quash the h-file invasions. He then became resourceful in his counterplay given his limited material. Nakamura's king hiked up the board to avoid the relentless checking, and in a study-like position he allowed Robson to promote to a queen. But as is often the case, a friendly knight shielded any further checks and soon Robson's chances were exhausted, forcing him to resign. For the defending champion Kamsky, no such bravery was needed to beat third-seeded GM Alex Onischuk. In only his second win ever against him (the first was during the quad finals of the 2010 Championship), Kamsky used the London System, an opening rare at professional levels due to its benign reputation. Eventually he acquired the two bishops, or the “mini exchange” as GM Garry Kasparov once termed it. In the final position, Kamsky can deftly avoid the threats to his own king by trading queens on d7, whereupon his pawn becomes unstoppable. Onischuk has the burden of playing the other frontrunner, Nakamura, tomorrow. 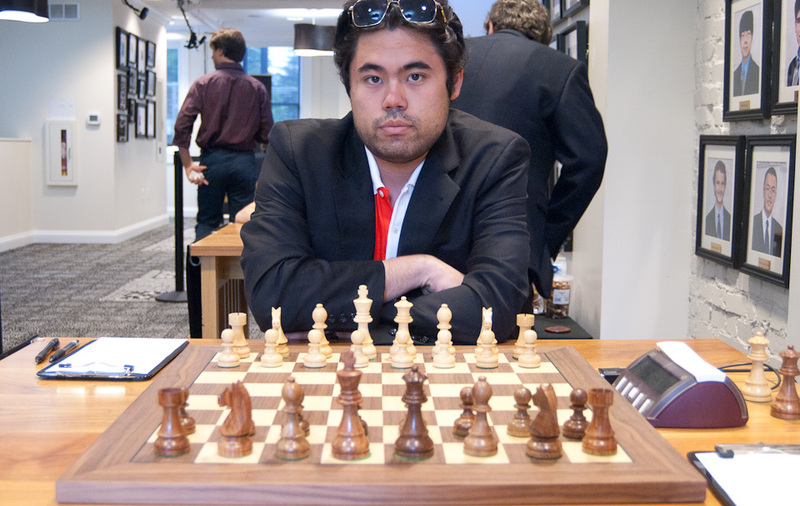 Earlier in the tournament, GM Alejandro Ramirez also had the daunting one-two punch, scoring one loss and one draw. Looking ahead, Nakamura and Kamsky are slated to meet in round 10. Lenderman claimed he was not at his best, but for a reason not heard much in chess circles. “I felt like I wasn't seeing the board clearly today; I think I overprepared,” he said, adding that he planned to study less for the next games. Joining Lenderman and Kaidanov with two points was GM Yury Shulman, the only player of that trio to have won a U.S. Championship. Shulman squeezed the veteran GM Yasser Seirawan, who is still without any points. Young GMs Robert Hess and Alejandro Ramirez drew in their first matchup ever, not counting a quick draw at last year's Thanksgiving Open in Saint Louis. In the women's tournament, IM Irina Krush won and caught up to her main rival, IM Anna Zatonskih. Krush beat WIM Viktorija Ni with the quieter 1. c4, instead of 1 .d4 and a likely King's Indian Defense, which is a mainstay in recent years at the U.S. Women's Championship. “I was a little bit confused by this move Bg5,” Krush said. “I wasn't expecting it. Then I thought, 'Oh, that's an interesting idea, stopping me from playing Ne3. '” But Krush called her “bluff”, playing 16. Ne3 anyway. Ni decided against doubling Krush's pawns at the cost of weakening her dark squares, but the resulting knight invasion to d5 proved no bargain either. Like Nakamura, Krush marched her king to the sixth rank for victory. She said she plans to use tomorrow's rest day to conserve her energy. Zatonskih endured a rarity at this year's championship – the higher-rated player getting surprised out of the opening. While Kamsky has played an offbeat Sicilian and Nakamura has essayed the Evans Gambit, it was the lower-rated WGM Sabina Foisor that uncorked the Chigorin Defense with 2...Nc6. A bewildered Zatonskih spent 25 minutes on her reply, and could not engineer any activity for her light-squared bishop. The game ended in a draw, but not before Zatonskih's queen's rook also took an interesting sojourn, traveling a1-d1-d2-d3-d4-f4-h4-h1 and switching places with her king's rook. Luckily, Zatonskih is a big fan of puzzles and compositions, and perhaps has seen a solution with rooks inverting their normal positions. Zatonskih and Krush are joined at 2.5/3 with WIM Iryna Zenyuk, the 8th seed out of ten players. Zenyuk won for the second day in a row, this time against WGM Tatev Abrahamyan. Zenyuk already has more points that she scored in all of last year's seven-game event. She will face one of her biggest challenges in round four - Zenyuk cedes more than 250 ratings points against Krush. Close behind with 2/3 is IM Rusudan Goletiani, who rebounded from her unsuspecting late-game errors in round two. Coming off that painful loss leaves the next game difficult to predict. She stifled FM Alisa Melekhina's pieces all game. “I was so mad at myself yesterday, I was determined to do really well today,” Goletiani said. She went out to eat with a large group of playing partners and was in good spirits by night's end, helping her to rebound today. WFM Alena Kats got her first win today by beating the winless WGM Camilla Baginskaite. The women are off tomorrow, but the U.S. Championship returns for round four at 1 p.m Central, 2 p.m. Eastern. Turn in to www.uschesschamps.com for live commentary from WGM Jennifer Shahade and GM Ben Finegold.